Back at the main partitioning window, you can review all your changes. As you can see, the partitioning scheme is quite a bit more complicated than your typical install. 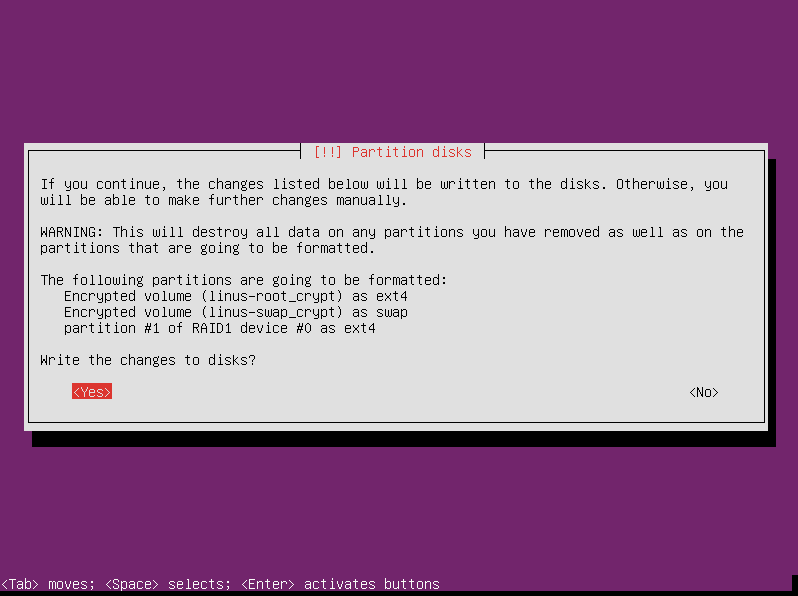 If everything looks good, select “Finish partitioning and write changes to disk” and press enter. 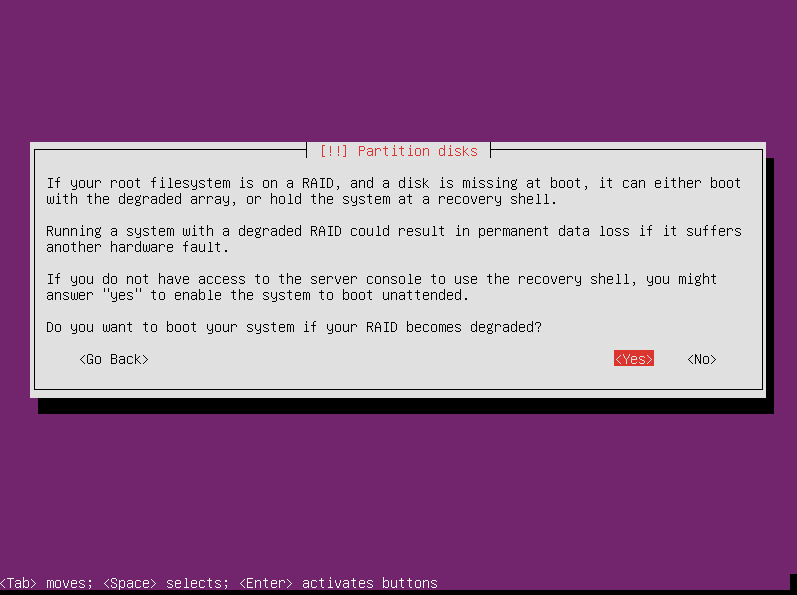 Since we have set up a RAID, the installer has an important question for us: if the system loses a drive, do you want to go ahead and boot anyway? Or do you want the system to stay in a recovery shell until the problem is corrected? Choose yes or no and press enter to continue. The installer then asks for confirmation to write changes to the disk. If you are happy with the way things are set up, select “Yes” and press enter. At this point, the installer starts writing the partitions you just set up. The rest of the installation proceeds as normal. If you have previous experience installing Ubuntu Server, there won’t be any surprises after this point. The installer installs the base system. It asks you to enter your proxy information (if you don’t know what this is, you probably don’t have one). Enter that info or leave it blank and press enter. 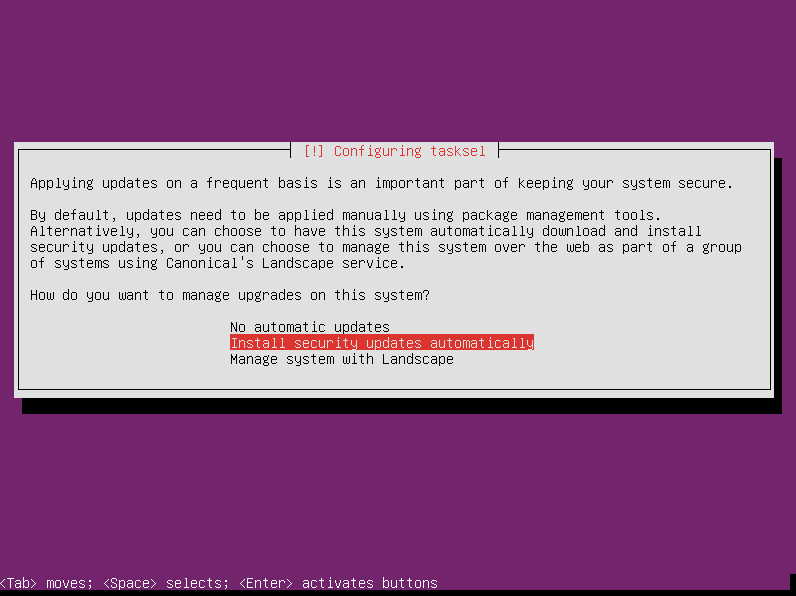 After some more configuration, the installer asks how you want to handle security updates. I like having them installed automatically. Choose whichever option you prefer and press enter. Select which additional packages you want to install using the space bar. You don’t have to select your packages now if you don’t want to. They can be installed later. Or if you do install the packages here, it doesn’t mean they are there forever. Anything you install here can be removed after the installation. After installing the base system and your packages, the installer asks if you want to install the GRUB boot loader to the master boot record. 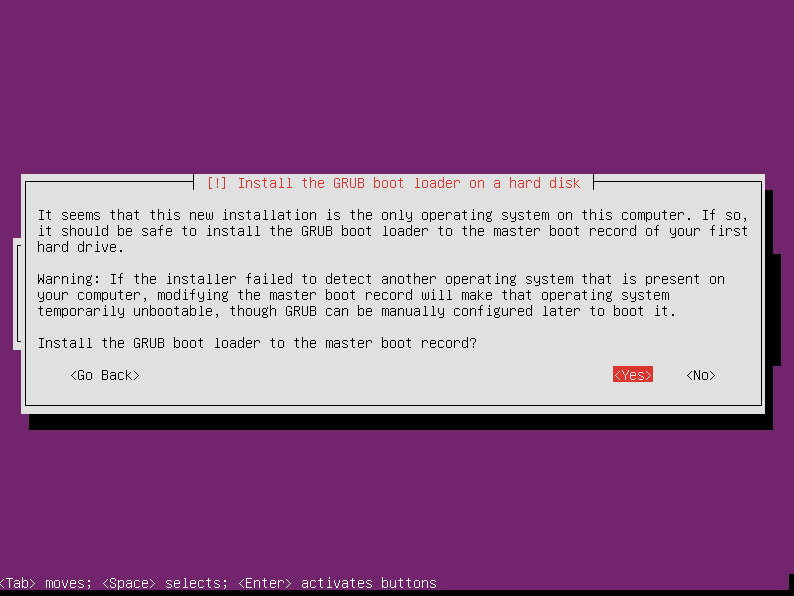 Unless you are dual-booting Ubuntu Server with another operating system, or have some other sort of unique circumstances, the GRUB boot loader is your friend. Choose “Yes” and press enter. 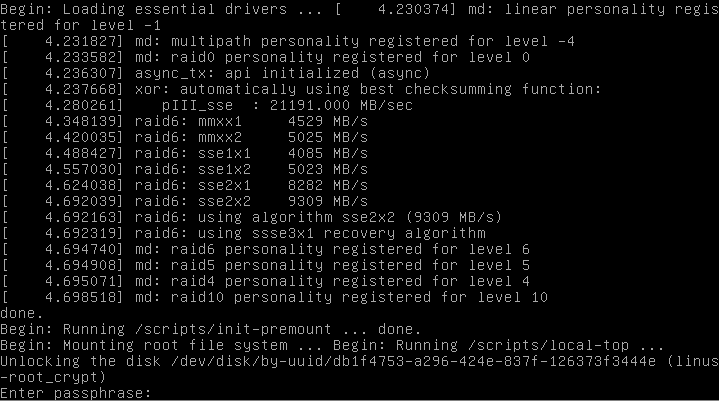 Once that is done, you are finally finished installing Ubuntu Server 12.04 with encrypted LVM on RAID1. Press enter to reboot your server. When the server reboots, you are prompted for your passphrase to decrypt the root filesystem. Enter the passphrase and press enter. 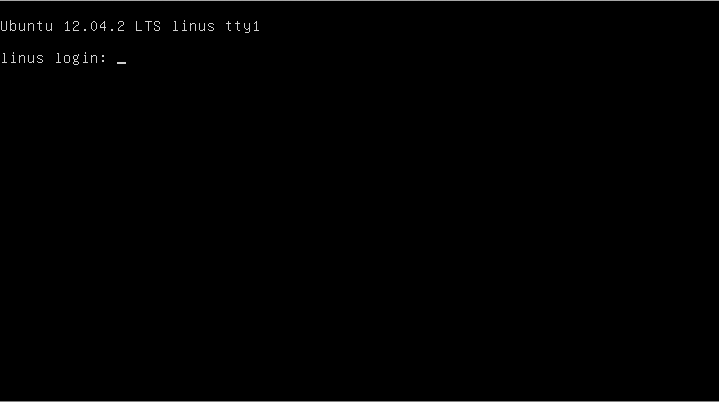 After the system finishes booting, you can now log in to your new Ubuntu Server 12.04 with encrypted LVM on RAID1. 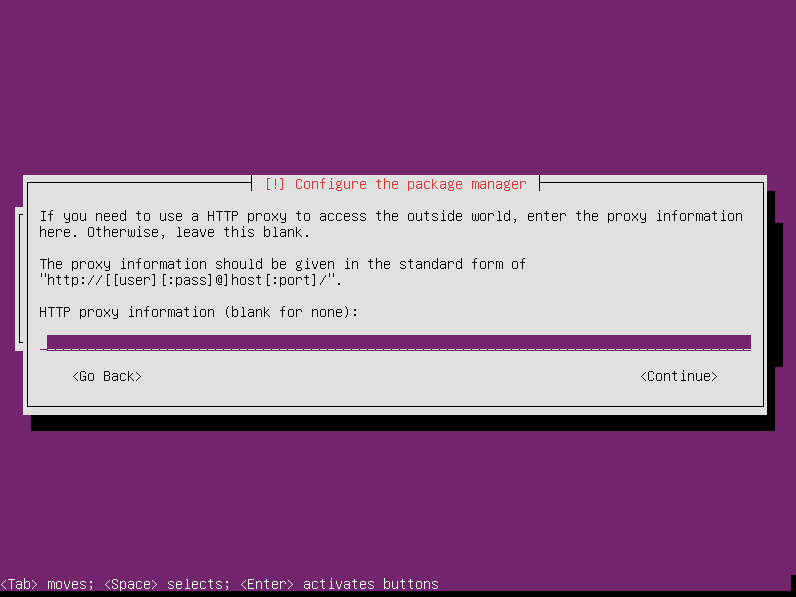 This tutorial shows one way to install Ubuntu Server 12.04 with encrypted LVM. In this case we used RAID1, but depending on how many hard drives you have available, you could create many other types of setups. The principles in this tutorial will help you install whichever type of setup you need. Basically, any system you come up with will have your RAID as a foundation for your logical volume manager, which forms containers for encrypted volumes. The RAID can be any kind you want (that the installer supports, that is). You can create as many logical volumes as you want. You can encrypt or not encrypt whichever of the volumes you want. What setup are you going to use?